Jewish holidays celebrate central themes in the relationship between God and the world, such as creation, revelation, and redemption. Shabbat, the weekly day of rest lasting from shortly before sundown on Friday night to shortly after sundown Saturday night, commemorates God's day of rest after six days of creation. It plays a pivotal role in Jewish practice, and is governed by a large corpus of religious law. The core of Shabbat prayer services, and also festival prayer services, is the public reading of the Torah, along with connected readings from the other books of the Tanakh, called Haftarah. Over the course of a year, the whole Torah is read, with the cycle starting over in the autumn, on Simchat Torah. At sundown on Friday, the woman of the house welcomes the Shabbat by lighting two, or more, candles and reciting a blessing. The evening meal begins with the Kiddush, a blessing recited aloud over a cup of wine, and the Mohtzi, a blessing, recited over the bread. It is customary to have challah, two braided loaves of bread, on the table. During Shabbat Jews are forbidden to engage in any activity that falls under 39 categories of melakhah, translated literally as "work." In fact the activities banned on the Sabbath are not "work" in the usual sense: they include such actions as lighting a fire, writing, using money and carrying in the public domain. The prohibition of lighting a fire has been extended in the modern era to driving a car, which involves burning fuel, and using electricity. Jewish holy days (haggim), celebrate landmark events in Jewish history, such as the Exodus from Egypt and the giving of the Torah, and sometimes mark the change of seasons and transitions in the agricultural cycle. The three major festivals, Sukkot, Passover, and Shavuot, are called "regalim" (derived from the Hebrew word "regel," or foot). On the three regalim, it was customary for the Israelites to make pilgrimages to Jerusalem to offer sacrifices in the Temple. Passover (Pesach, meaning sacrifice) begins a week-long holiday beginning on the evening of the 14th day of Nisan (the first month in the Hebrew calendar, falling in the March - April time period), that commemorates the Exodus from Egypt. It is the only holiday that centers on home-service, the Seder. The Seder meal is a meal of six different symbolic foods that are arranged on a plate as they have special significance in retelling the story of the exodus from Egypt. Passover is in honor of the night when the Lord "passed over" the homes of the Israelites. The Hebrews followed God's instructions by smearing the blood of a lamb on the doorframes of their homes so that their first born would not die. As God had warned the Pharaoh through Moses, release the Israelites, or he would lose his first born son. He lost his son that night, and this is when he released the Israelites. The Festival of Unleavened Bread begins the day after the Passover celebration, a week long celebration, to remind Israel of their escape from Egypt in that for seven days they ate unleavened bread (bread without yeast). The bread reminded them to obey quickly. Their ancestors left the yeast out of their dough so that they could leave Egypt quickly without waiting for the dough to rise. Leavened products (chametz) are removed from the house prior to the holiday, and are not consumed throughout the week. Homes are thoroughly cleaned to ensure no bread or bread by-products remain, and a symbolic burning of the last vestiges of chametz is conducted on the morning of the Seder. Matzo (a cracker-like flatbread made of plain white flour and water) is eaten instead of bread. Shavuot ("Pentecost", the fiftieth) celebrates the revelation of the Torah to the Israelites on Mount Sinai. Also known as the Festival of Bikurim, or first fruits, it coincided in biblical times with the end of the barley harvest, and the beginning of the wheat harvest. It occurs on the sixth day of the Hebrew month of Sivan (late May or early June time period). Shavuot commemorates the anniversary of the day God gave the Ten Commandments to Moses and the Israelites at Mount Sinai. The date of Shavuot is directly linked to that of Passover. The Torah mandates the seven-week Counting of the Omer (the verbal counting of 49 days), beginning on the second day of Passover, and immediately followed by Shavuot, the 50th day. This counting of days and weeks is understood to express anticipation and desire for the Giving of the Torah. On Passover, the Jewish people were freed from their enslavement to Pharaoh. On Shavuot they were given the Torah, and became a nation committed to serving God. The idea of counting each day represents spiritual preparation and anticipation for the giving of the Torah, which was given by God on Mount Sinai at the beginning of the month of Sivan, around the same time as the holiday of Shavuot. The Sefer HaChinuch ("Book of Education" is a work which systematically discusses the 613 commandments of the Torah) states that the Jewish people were only freed from Egypt at Passover in order to receive the Torah at Sinai, an event which is now celebrated on Shavuot, and to fulfill its laws. Thus, the Counting of the Omer demonstrates how much a Jew desires to accept the Torah in their own life. Sukkot ("Feast of Tabernacles" or "The Festival of Booths") commemorates the Israelites' forty years of wandering through the desert on their way to the Promised Land. It is celebrated through the construction of temporary booths called sukkot that represent the temporary shelters of the Israelites during their wandering. It coincides with the fruit harvest, and marks the end of the agricultural cycle. Jews around the world eat in sukkot for seven days and nights. Sukkot occurs in autumn on the 15th day of the month of Tishrei (late September to late October time period). The holiday lasts seven days, including Chol Hamoed. The word Sukkot is the plural of the Hebrew word sukkah, meaning booth, or hut. The sukkah is reminiscent of the type of huts in which the ancient Israelites dwelt during their 40 years of wandering in the desert after the Exodus from Egypt. During this holiday, Jews construct and reside in sukkot, small and large. Here families eat their meals, entertain guests, relax, and even sleep. Sukkot concludes with Shemini Atzeret, where Jews begin to pray for rain and Simchat Torah, "Rejoicing of the Torah," a holiday which marks reaching the end of the Torah reading cycle and beginning all over again. The occasion is celebrated with singing and dancing with the Torah scrolls. The High Holidays (Yamim Noraim or "Days of Awe") revolve around judgment, and forgiveness. 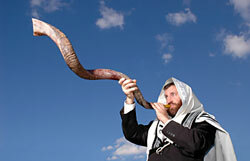 Rosh Hashanah, (also Yom Ha-Zikkaron or "Day of Remembrance," and Yom Teruah, or "Day of the Sounding of the Shofar"). Rosh Hashanah is the Jewish New Year (Hebrew meaning, "head of the year"); although, it falls on the first day of the seventh month of the Hebrew calendar, Tishri (early September to late September time period). It is the New Year for people, animals, and legal contracts. Rosh Hashanah marks the beginning of the 10-day period of atonement leading up to Yom Kippur, during which Jews are commanded to search their souls, and make amends for sins committed, intentionally or not, throughout the year. Holiday customs include blowing the shofar, or ram's horn, in the synagogue. The blowing of the shofar intended to awaken the listener from his or her "slumber," and alert them to the coming judgment. The Mishnah, the core text of Judaism's oral Torah, contains the first known reference to Rosh Hashanah as the "day of judgment." In the Talmud, it states that three books of account are opened on Rosh Hashanah, wherein the fate of the wicked, the righteous, and those of an intermediate class are recorded. The names of the righteous are immediately inscribed in the book of life, and they are sealed "to live." The intermediate class is allowed a respite of ten days, until Yom Kippur, to repent, and become righteous. The wicked are "blotted out of the book of the living." Yom Kippur, ("Day of Atonement") is the most solemn day of the Jewish year. It is the most solemn, and important, of the Jewish holidays. 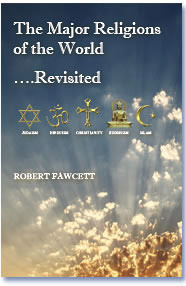 Its central themes are atonement and repentance. Jews traditionally observe this holy day with a 25-hour period of fasting and intensive prayer, often spending most of the day in synagogue services. It is a day of communal fasting, and praying for forgiveness for one's sins. Observant Jews spend the entire day in the synagogue, sometimes with a short break in the afternoon, reciting prayers from a special holiday prayer book called a "Mahzor." 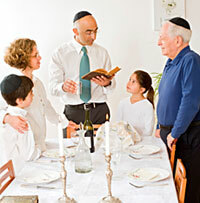 Many non-religious Jews make a point of attending synagogue services, and fasting on Yom Kippur. Yom Kippur is the tenth, and final day, of the Ten Days of Repentance which begin with Rosh Hashanah. According to Jewish tradition, God, or "YHVH" ("The One Who Was, Is and Shall Be"), inscribes each person's fate for the coming year into a "book" on Rosh Hashanah, and waits until Yom Kippur to "seal" the verdict. During the Ten Days of Repentance, a Jew tries to amend their behavior, and seek forgiveness for wrongs done against God and against their fellow man. The evening and day of Yom Kippur are set aside for public and private petitions, and confessions of guilt. At the end of Yom Kippur, one considers one's self absolved by God. On the eve of Yom Kippur, before candles are lit, a prefast meal, the "seuda mafseket," is eaten. During Yom Kippur, adults are required to refrain from eating or drinking for a 25-hour period from one-half hour before sundown until nightfall the next day. By properly preparing your body for this "affliction of the soul," as it is known, you can reduce the pain and discomfort associated with the fast. Synagogue services on the eve of Yom Kippur begin with the Kol Nidre prayer. 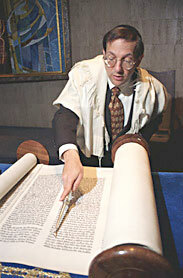 Kol Nidre is a declaration recited in the synagogue before the beginning of the evening service. Though not a prayer, this dry legal formula, and its ceremonial accompaniment, have been charged with emotional undertones since the medieval period, creating a dramatic introduction to Yom Kippur on what is often dubbed "Kol Nidrei night". It is written in Aramaic, not Hebrew. Its name is taken from the opening words, meaning "All vows." The Kol Nidre is not a prayer. It is recited three times on the Day of Atonement, the holiest day of the year, in order to be sure that all have heard, and recited it. It is a sort of contract between man, the individual, and God asking God's forgiveness for obligations made either unknowingly or under coercion during the previous (not forthcoming) year. It only affects promises made to God, and not promises, or obligations, made to other men. In other words, it is a plea for forgiveness to God for offenses made to him. It does not negate any obligations made to other men, and only asks God's pardon for unknowingly offending Him, or for having offended Him, because another forced one to do so (such as the Law of Apostasy; meaning, forcing one to forsake their religion for another). All vows: "Prohibitions, oaths, consecrations, vows that we may vow, swear, consecrate, or prohibit upon ourselves - from this Yom Kippur until the next Yom Kippur, may it come upon us for good - regarding them all, we regret them henceforth. They will all be permitted, abandoned, cancelled, and null and void, without power and without standing. Our vows shall not be valid vows; our prohibitions shall not be valid prohibitions; and our oaths shall not be valid oaths." It is customary to wear white on Yom Kippur, especially for Kol Nidre, and leather shoes are not worn. The following day, prayers are held from morning to evening. The final prayer service, called "Ne'ilah," ends with a long blast of the shofar. Hanukkah, also known as the Festival of Lights, is an eight day Jewish holiday that starts on the 25th day of Kislev of the Hebrew calendar (late November to late December time period). From the Hebrew word for "dedication" or "consecration", marks the rededication of the Temple in Jerusalem after its desecration by the forces of the Seleucid Empire (The Seleucid Empire was a successor state of Alexander the Great's empire. ), and commemorates the "miracle of the container of oil." The background is that nearly 2,200 years ago, the Greek-Syrian ruler Antiochus IV of the Seleucid Empire tried to force Greek culture upon peoples in his territory. Jews in Judea (which was the northern part of current day Israel) were forbidden their most important religious practices, as well as study of the Torah. Although vastly outnumbered, religious Jews in the region took up arms to protect their community and their religion. Led by Mattathias the Hasmonean, and later his son Judah the Maccabee, the rebel armies became known as the Maccabees. After three years of fighting, in the year 3597, or about 165 BC, the Maccabees victoriously reclaimed the temple on Jerusalem's Mount Moriah. Next they prepared the temple for rededication. In the temple they found only enough purified oil to kindle the temple light for a single day. But miraculously, the light continued to burn for eight days which was the length of time it took to press, prepare, and consecrate fresh olive oil. The festival is observed in Jewish homes by the kindling of lights (the Menorah) on each of the festival's eight nights, one on the first night, two on the second night, and so on. The Hanukkah Menorah is an eight-branched candelabrum lit during the eight-day holiday of Hanukkah. 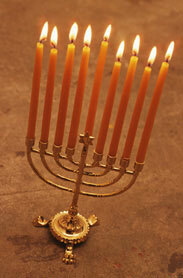 The ninth holder, called the Shamash ("helper or servant"), is for a candle used to light all other candles. Candelabra is the term traditionally referring to a pair, or more, of large, decorative candlesticks for holding candles. A single example of such lighting devices is known as a candelabrum. Hanukkah is not mentioned in the Bible, and was never considered a major holiday in Judaism, but it has become much more visible and widely celebrated in modern times, mainly because it falls around the same time as Christmas. In addition, it has national Jewish overtones (The Maccabees courageous military victory against superior odds) that have been emphasized since the establishment of the State of Israel. Purim is a joyous Jewish holiday that commemorates the deliverance of the Persian Jews from the plot of the evil Haman, who sought to exterminate them, as recorded in the biblical Book of Esther. Purim is celebrated annually on the 14th of the Hebrew month of Adar (the February or March time period). It commemorates a time when the Jewish people living in Persia were saved from extermination. The heroes of the story are Esther, a beautiful young Jewish woman living in Persia, and her cousin Mordecai, who raised her as if she were his daughter. As to background, Jewish exiles who had been living in the Babylonian captivity (6th Century BC) found themselves under Persian rule after Babylonia was in turn conquered by the Persian Empire. Esther was taken to the house of Ahasuerus, King of Persia, to become part of his harem. King Ahasuerus loved Esther more than his other women, and made Esther queen. But the king did not know that Esther was a Jew, because Mordecai told her not to reveal her identity. The villain of the story is Haman, an arrogant, egotistical advisor to the king. Haman hated Mordecai because Mordecai refused to bow down to Haman, so Haman plotted to destroy the Jewish people. Mordecai persuaded Esther to speak to the king on behalf of the Jewish people. This was a dangerous thing for Esther to do, because anyone who came into the king's presence without being summoned could be put to death, and she had not been summoned. Esther fasted for three days to prepare herself, and then went into the king. He welcomed her. Later, she told him of Haman's plot against her people. The Jewish people were saved, and Haman was hanged on the gallows that had been prepared for Mordecai. It is characterized by public recitation of the Book of Esther, mutual gifts of food and drink, charity to the poor, and a celebratory meal (Esther 9:22). Other customs include drinking wine, wearing of masks and costumes, and public celebration. Purim is one of the most joyous and fun holidays on the Jewish calendar.